Two New Yorkers present the very best things to do in the greatest city in the world, now completely revised and updated in a second edition. Organized by theme–including Eating and Drinking, 24-hour New York, Shopping and Spending, Arts and Culture, Views and Sites, the Great Outdoors, and Classic New York–and packed with detailed, helpful indexes organized by neighborhood and by category, this is simply the most fun and comprehensive guidebook to New York City ever. The Best Things to Do in New York crosses genres and boroughs to explore every aspect of the most diverse and exciting city in the world. 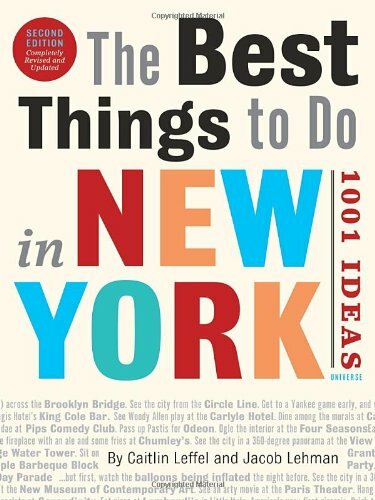 Written from experience by two people who love the city, and featuring priceless tips from expert contributors–from authors on their favorite bookstores to architects on the city’s best buildings–The Best Things to Do in New York is much more than just a guide.